BakeTool is the In-House solution developed by Cogumelo Softworks for Bake Rendering with Cycles and BI. For those that work with Interactive Ambient , Arch Viz, Games... and need a Blender Baking Solution for your Assets, Full scenes, High Poly to Low Poly Normal Maps and others, Bake Tool is just what you need. BakeTool is an add-on for blender 2.7x that redesigns the way that Blender Bake works with a more coherent and easier workflow. The way that Cycles and BI Bake workflow works today is too slow and complicated to handle large scenes and for daily usage. If you need to bake assets or scenes in a more easier, fast and safer way then BakeTool is just what you need. Viewport Report: See the progress in the viewport with our interactive report system. Safe & Easy: BakeTool doesn't mess up your materials, scene, or objects. Just configure it as if for a render and Bake! Multi Job & Multi Pass: Configure many jobs and passes you want setting object, devices, sizes and samples and bake it all once! Assets or Full Scenes: Just add the objects that you want to Bake to the List with the "Selected to List" button. Individual or Atlas Mode: You can bake objects as Individual Textures per pass or Join everything in a single Atlas per pass. Bake to Target: Do you want to Bake High to Low Poly models or just Bake to a single Object? Just use Bake to Target! Auto Save Externally and Pack in .Blend: Don't mess up your texture library, totally safe internal and external save. Auto Config Image Format: Just select the format, we change all parameters for you to give you the best File Size/Quality. Automatic UV Unwrap Function: Automatically create and unwrap non overlapped uvs for your objects. Speed up your workflow a lot! New Pack UV Space Function: Problems with Overlapped UVs in multiple Objects? Not anymore! BakeTool has its own Pack UV Space Function that makes the active UV of selected objects into a Big Atlas without Overlaps! We are a small studio from Brazil, and we have already done some great things for Blender such as Graph Theme and BoolTool add-on. Now we need to raise some money to keep developing Baketool and our other Add-ons. We want to support BF with blender development as well, so we’re assigning part of all sales for the BF Development Fund. That’s our way of saying Thanks to BF for all the good stuff that they have done. On top of it, BakeTool is the Best solution for Blender Baking on the Market, so if you just want a tool to work with Baking, BakeTool is what you need! Suported version now is Blender 2.78b. New Automatic UV Unwrap System! Bug fixes in BI reports and more. Many Bug fixes for all areas. Added Blender Internal Render Support! New Error Catch system with more than 20 error handlers with Info Reports. If you don't have a GPU Device enabled in User Preferences it don't show the device selector per pass anymore, it show a message informing that it will use CPU instead. If you have any problem please contact us inbox. This item has an average rating of 4 from 21 ratings by the community. Any chance for a 2.80 update? Tool works, but not happy with the support, after several reminders, no reaction, solved the issue by myself in the end. Cuts the time to bake in cycles by more than half, at least by my estimation. Fantastic addon that I will likely use for many years to come. 1. Automatically bake textures of all images from a specified folder. 2. Bake multiple materials that each has multiple textures separated by folders. Hi. I bought BakeTool few weeks ago. I found that this add-on took much longer time to bake a texture than the blender's default method does. And sometime, the operation makes Blender "Not Responding", and I don't know what was running behind, and what I was waiting for. I baked all my texture manually, using Blender's default method at the end. Can this problem be solved? FYI, I am using Blender 2.79. Hi wshiab Please contact us in Inbox Support. We will be happy to help you. Sure there's something quite wrong with your configuration. I think that it could be too large textures (8~16K) or too much samples but we can take a look closer about your scene. About it be slower than blender's bake it's impossible since we use it. We don't implement a new bake system just a easier workflow to use it. Bye! This is a great addon. I've been using it for a long time. Hoping to see support for the Principled Shader soon. When it works, it's wonderful, but I've been trying to combine my Substance designer materials onto one UV Atlas and this addon just won't do it. It actually creates atlas maps and then maps the old overlapping images on top of that. There are huge image textures in these materials so I think it has something to do with that. When I tried simple scenes such as those in the demo videos, the addon worked well. Anxiously waiting for the next update, which I hope will work better. I'm not ready to give up yet. It can be very useful at times, but it is one of the fussiest damn programs I've ever used. It has numerous quirks, like requiring you to restart Blender between bakes. It also has a lot of issues with layers. The issues are compounded by the fact that the documentation is threadbare, and you have to go find all the quirks on your own. It can be a very useful tool if you do a lot of texture baking, but prepare yourself for days of banging your head against your desk trying to figure out how to get it to work consistently. This addon it's just awesome! It is a great addon for baking textures... a bit confusing but much more powerful than the default one. Great addon, I use it mostly to pre-render architectural visualisations for VR. Great Baking tool addon for blender. Working on a game where I bake lightmaps in Blender and export the atlas textures into Unity. Without any doubt BakeTool greatly simplifies the process. 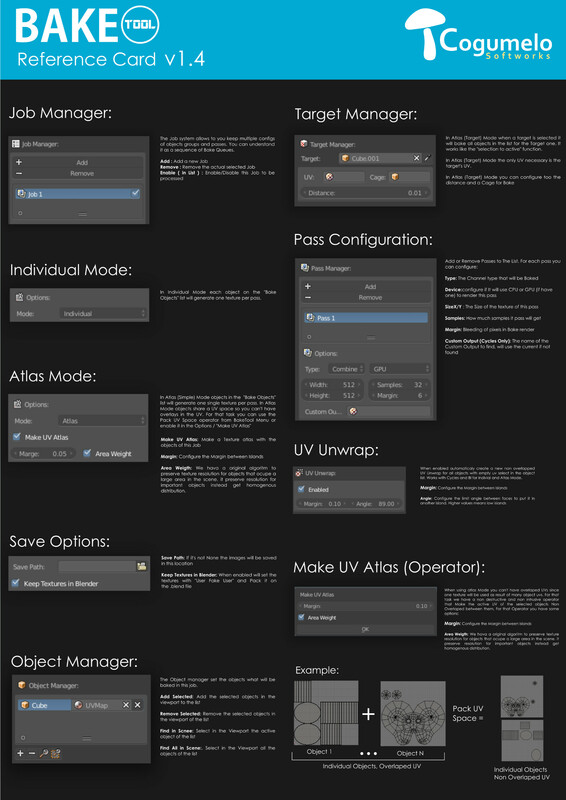 If you like Unity take a look at B2U Blender Addon here in Blendermarket. B2U and Baketool make a great ToolSet to produce Assets for Unity! When I had to bake several objects in succession, I needed this addon. It works great. Hi 10rafa. We answered your issue inbox. We would be glad to help you. Agree, THIS is how should be Blender's baking system! A must-have for baking. It is impossible to effectively bake Cycles GI without it.